The ruins of Balmerino Abbey stand in a beautifully tranquil corner of northern Fife close to the south bank of the River Tay and some five miles south west of the Tay Road Bridge. The origins of the abbey date back to 1229. 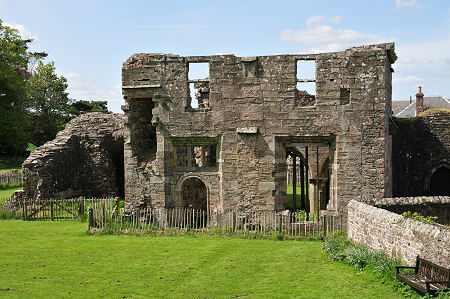 Queen Ermengarde, the widow of William the Lion and mother of Alexander II, invited the Cistercians at Melrose Abbey to set up a daughter-house at Balmerino. 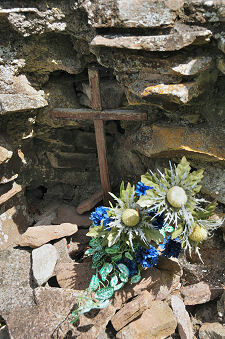 She chose this location close to the north Fife coast because of its benign climate and perhaps because of its existing religious connections. At the time the settlement here was known as Balmerinach, or St Merinac's Place: named after one of the monks who accompanied St Regulus (or St Rule) when he is said to have brought the bones of St Andrew to Scotland in 347. On this basis, Balmerino Abbey may have been founded on a site first chosen for a chapel nearly nine centuries earlier by St Merinac. Building work was still under way in 1286 and the abbey was presumably completed at the end of the 1200s or early in the 1300s. 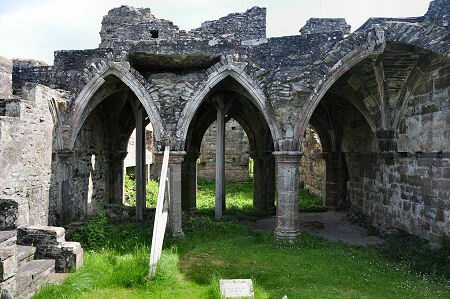 In plan, Balmerino Abbey was unusual (like its mother house, Melrose Abbey) in having a cloister to the north of the abbey church. It was more usual in Scotland's northern latitudes to build the cloister on the south side, out of the shadow of the church. Balmerino Abbey was attacked and burned by an English Army under the Earl of Hertford in 1547, but swiftly repaired. More serious damage was done by the Reformation's mobs in 1559 (see our Historical Timeline). The usual pattern of rapid decline followed, and in 1605 the estates were granted to Sir James Elphinstone, First Lord Balmerino. 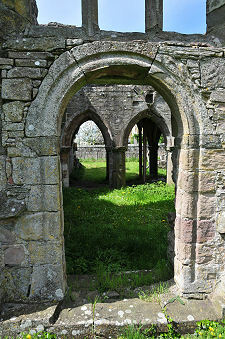 Balmerino Abbey suffered more than most in the years following the Reformation and not much of it remains today. The main standing structures are the walls and vaulting of the sacristy, chapter house and parlour, together with parts of the lower walls of the north transept of the abbey church. 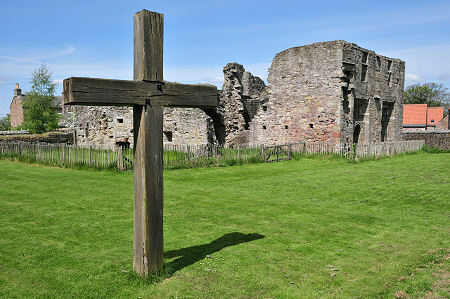 The site of the altar and Queen Ermengarde's (later desecrated) grave are marked by a large wooden cross. Parts of the north wall of the nave of the abbey church still stand to a few feet high, and on the far side of the site an ivy covered mound complete with gloomy opening leading into a vaulted cellar is all that is left of the abbot's house. 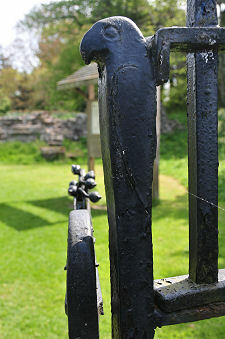 Most of the abbey ruin is in a dangerous condition as shown by the wooden props holding up various parts of the structure, and the main part is fenced off for the safety of visitors. 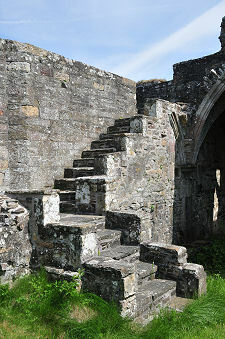 What became of the structure of the rest of the abbey? You don't have to look very far for clues. 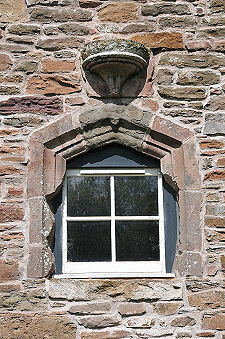 The window of a converted farm steading overlooking the chapter house incorporates a mix-and-match of stonework from the abbey: see the photo on this page. None of it quite fits and the window is topped off with what looks like it was originally a piscina, the basin for washing communion vessels, probably originally located in a side wall of the choir near the altar. Not far from the site of the abbot's house is a vast and extremely ancient Spanish Chestnut tree. This is traditionally believed to have been planted by Queen Ermengarde in 1229 to mark the foundation of the abbey. A nearby sign says that analysis by the National Trust for Scotland suggests that the tree dates back to he second half of the 1500s. But why let the absence of a few tree rings get in the way of a wonderful story? And if nothing else, it does give a very visual representation of just how long it has been since the abbey was a thriving concern: it was at best likely to have been a sapling when the Reformation took place.